What was the star of Bethlehem? It is a puzzle which has confounded theologians and astronomers for the best part of two millennia. 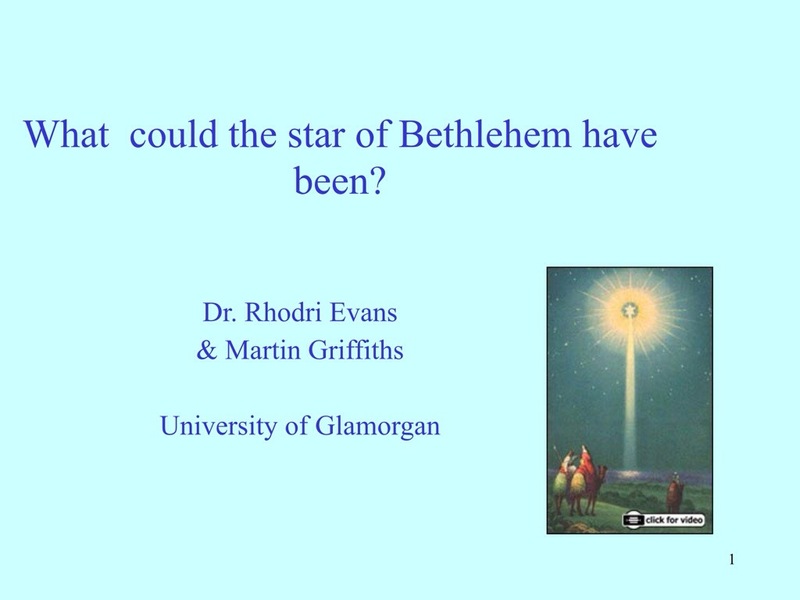 Here is a talk that myself and Martin Griffiths gave in December 2004 on this subject at the University of Glamorgan. Enjoy! Introductory slide. This talk was given by myself and Martin Griffiths at the University of Glamorgan in December 2004 as part of a series of public lectures on Astronomy. What are the motivations for talking about this subject? “Adoration of the Magi” by Gioto. How the Star of Bethlehem is described in the Bible, in Matthew, Chapter 2, Verse 1. Herod was a real historical character. It is well documented that he died in 4 B.C. Who were the “3 wise men”? They were most likely astrologers/astronomers, who were familiar with the night-time sky. Christmas is celebrated in late December, but this is almost certainly not when Jesus was born. Rather, Christians hijacked an already popular Pagan festival based on celebrating the passing of the shortest day of the year, the Winter Solstice on the 21st of December. The range of dates for Jesus’ birth as delimited by various historical and Biblical events. What was the star of Bethlehem. A number of theories exist, but there is no definitive answer. What are the possibilities? Presumably, for it to gain the attention of the three wise men, it must have been a rare celestial event. What are these? Although depicted in some paintings as a comet, it is unlikely to have been a comet or it would have been described as such. Maybe it was an exploding star. The image shows the explosion of Supernova 1987A, a supernova which exploded in our neighbouring galaxy, the Large Magellanic Cloud, in February 1987. Novae would not have been considered particularly uncommon. Supernovae can be much brighter, but no remnant has been found. Was the star a close alignment of two or more planets? In 7 B.C. Jupiter and Saturn came together three times in the course of the year, a very unusual event. When Kepler’s supernova appeared in 1604 it did so near an alignment of Mars, Jupiter and Saturn. It was thought by some at the time that it was this alignment of these three planets that led to the appearance of the new “bright star”. We now know a supernova is due to the explosion of a massive star. In December 9 to February 8 B.C. Mars, Jupiter and Saturn caem close together in the constellations Capricorn and Aquarius. In 7 B.C. the planets Jupiter and Saturn came close together three times, each time to within about 1 arc minute of each other (the Moon is 0.5 arc minutes across). In February to March 6 B.C. the three planets Mars, Jupiter and Saturn came close together. Comets were thought to be the harbingers of great historical events. In Giotto’s “Adoration of the Magi” the star is portrayed as a comet, but in reality it is very unlikely it was really a comet. It certainly wasn’t Halley’s comet. A star chart for the 15th of October 7 B.C. showing Jupiter being occulted by the Moon in the constellation Aries. Michael Molner has suggested a theory that the star of Bethlehem was in fact the Moon occulting Jupiter in the constellation Aries in the year 7 B.C. A star chart for the 17th of April 6 B.C. showing the Moon nearly occulting Jupiter in the constellation Aries, along with Venus, the Sun, Mars and Saturn all being in the same part of the sky. In Molner’s theory, Aries was important to the Jews as it was the sign of King Herod’s kingdom. The morning sky looking East on the 17th of April 6 B.C. showing the Moon nearly occulting Jupiter, with Saturn and the Sun also in the constellation Aries. It is possible that the 3 wise men were prompted to investigate an event such as a nova in 5 B.C. after a succession of unusual celestial events in 7 B.C. and 6 B.C. Although different scholars have placed different dates on Jesus’ birth, the astronomical evidence points towards 7 to 5 B.C. as being the most likely range of dates. Which theory do you like best? it should be clear why the 7 BC conjunction and only that can be considered the true star phenomenon. The original and unprecedented proofs given in the article following the statements of the poem are too many and exact to be dismissed despite the revulsion some will feel at the astrological input; but one needs to recall the Magi were in any case ancient astrologers. And btw a comet can’t even be in contention. Comets were traditionally messengers of ill not good tidings to all mankind. It was, very probably, nothing at all. Every Christmas, planetaria etc have presentations on this, because it is astronomical, but that doesn’t mean it has to have been a real event. Much of the Bible is fiction. Do shipbuilders have talks on Noah’s ark? Construction workers on Jacob’s ladder? Do people consider parting the sea before building a bridge or tunnel? If there wasn’t such a phenomenon, or if it were supernatural, then astronomers have nothing to say on the matter. But if there really was some celestial event, I think it’s interesting to discuss the possibilities. In the article “Magi” https://www.britannica.com/… it’s written: “Where is the child who has been born king of the Jews? For we have seen his star at its rising, and have come to pay him homage” (Matthew 2:2). So, the gospel says the first time the magi saw “his star at its rising” (note well: not in the East in their country as all the scholars always supposed). After the first sighting the magi came to Jerusalem. Thus probably the magi were near Jerusalem when at dawn they saw the “star at its rising”. The same day they came to Jerusalem in the late morning or afternoon, so the star was not visible in daylight. Herod met the Magi in the evening and he wanted them to show him the star. However, the star had not yet risen and he “found out from them the exact time the star had appeared” (Matthew 2:2). “The other sighting of the star was near their journey’s end, when the omen “came and stood over where the young child was.” More precisely when the magi were near the house where the Holy Family stayed. or if you see my comments on the subject on the Internet (e.g. http://www.skyatnightmagazi… etc.). Alexander I. Reznikov. Moscow, Russia. That’s what I heard, but it was via someone else. It’s very far from any subject in which I could claim any knowledge.